The Smithsonian Institution comprises of 19 free national museums that hold some of the most significant documents and artefacts in American history. Two of these, located in downtown Washington D.C and Chantilly, VA, make up Smithsonian Air and Space. AeroResource correspondent Michael Lovering reports from the US capital. Washington D.C. is a remarkable city steeped in history: An internationally recognised building or monument can be found around every corner amongst its grand plazas and white marble facades. Just a stone’s throw away from the US Capitol is the Smithsonian Institution complex and the imposing National Air and Space museum. Constructed of three large glass atriums connected by small themed rooms, the museum contains some of the most significant aircraft and space artefacts from the history of manned flight. As such it is one of the most popular divisions of the Smithsonian for families and enthusiasts alike. After waiting in line for the obligatory security screening, which was quick, efficient and friendly, the entrance leads to the central atrium where aircraft representing milestones of flight are displayed both on the ground and suspended from the roof. 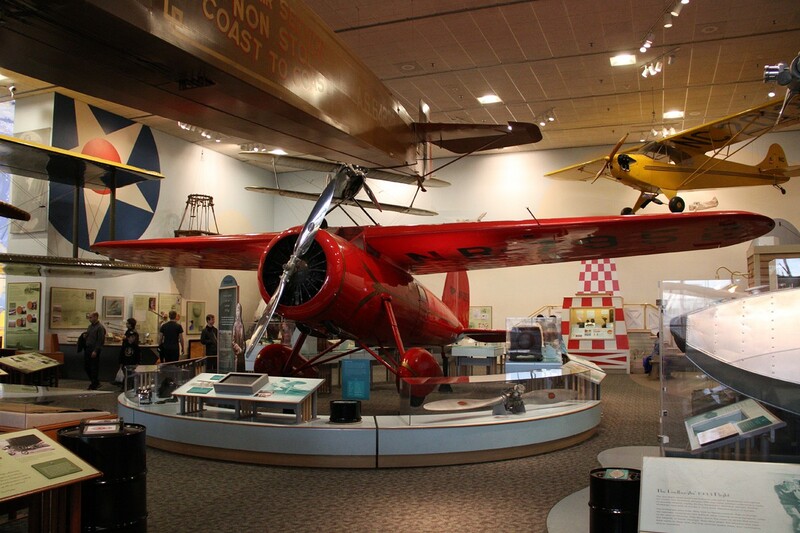 Within this hall, the earliest significant exhibit is Charles Lindbergh’s Ryan NYP Spirit of St Louis, which completed the first solo nonstop transatlantic flight in 1927. This is flanked by the Bell X-1 in which Chuck Yaeger first reached Mach 1.06 in 1947, and the Bell XP-59A Airacomet – The first American jet powered aircraft that first flew in 1942. The story of evolving speed capabilities is concluded with the hypersonic rocket powered North American X-15 and a number of space and rocketry exhibits including a Sputnik 1 satellite, the Mercury 7 command module in which John Glenn orbited the earth in 1962 and a comparison of Pershing-II and SS-20 ICBMs. Perhaps the most important item in the hall is the Apollo 11 command module, Columbia. It was in this vehicle in that Michael Collins, Neil Armstrong and Buzz Aldrin returned to earth after making history in 1969. Each exhibit is given plenty of space and the second floor raised walkway enables a very close view of the suspended aircraft. The glass roof of the atrium lights the aircraft adequately, although on a sunny day the shadows of the supporting beams can be distracting. In the evening, dramatic lighting is switched on, really helping to define the sharp lines on the X-15 and give a more equal tone to the Ryan NYP. The second large atrium is themed around commercial air travel in the United States with the exhibits representing how technology has revolutionised the airline industry and how the flying experience has changed for passengers. The earliest commercial airlines in the US were founded to carry mail and this era is represented by a smart black and yellow 1927 Pitcairn PA-5 Mailwing and the sleek single engine Northrop Alpha. Regular mail flights revealed there was a demand for passenger flights on the same routes and so new aircraft designs were conceived with enclosed cabins for paying passengers. One of the first of this kind was the Fairchild FC-2 built in 1927. Capable of carrying 4 passengers, the museum’s example was operated by Pan American-Grace Airways in South America. Enclosed cabins led the way for rapid expansion in capacity and performance and in the 1920s and 30s some of the most iconic passenger aircraft of all time were produced. 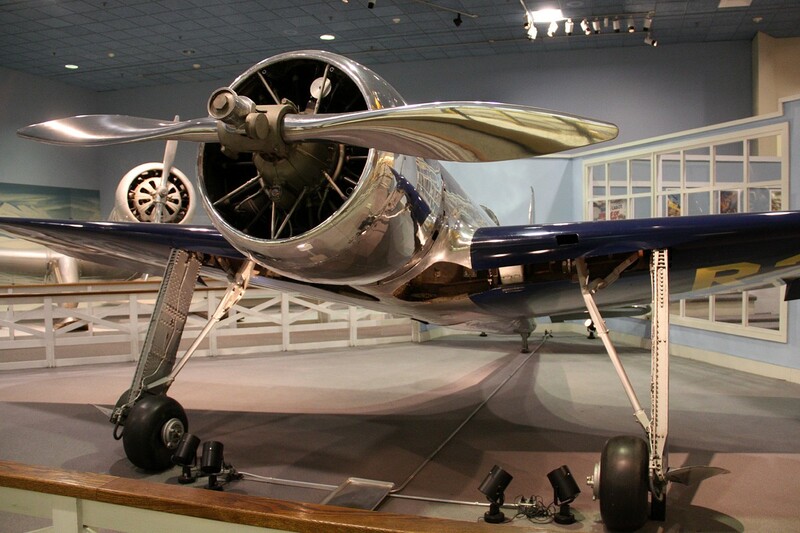 The Smithsonian collection includes a 1928 Ford 5-AT Tri-Motor operated by American Airlines, and the much improved Boeing 247-D that reduced the US coast to coast flying time by 8 hours. Finally, no collection of transport aircraft from the 1930s could be complete without an example of the venerable Douglas DC-3. An American icon, the DC-3 is one of the longest serving passenger aircraft of all time with over 400 still flying around the world. Whilst the museum isn’t large enough for many modern airliners to finish the air transport story, a very impressive 747 nose section is also displayed against the wall. Visitors are able to enter the upper deck and cockpit via a raised gantry which also offers good views of the other exhibits. The final atrium is devoted to space exploration and rocketry. A circular cut out in the centre of the floor allows medium size rockets to be displayed in the erected position and is fairly spectacular to walk around. The hall also contains a number of other exhibits including satellite prototypes and space suits. Of particular interest are the Hubble telescope and Skylab satellite prototypes, the latter being open for visitors to walk through. The selection of ballistic missiles on display is also impressive, ranging from German V1 and V2 rockets to the US Minuteman III silo based ICBM which could carry three independently targeted nuclear warheads. In addition to the main display halls, Air and Space also has 19 smaller rooms, each themed around a historical era or aircraft role. These range from naval aviation to the Wright Brothers and generally contain three or four full aircraft along with a number of smaller exhibits explaining the context of the airframes’ significance. Despite visiting the museum twice, the author still did not have time to fully explore all of these rooms, so planning for areas of interest is a must! At the far end of the building is an increasingly important section devoted to the development of unmanned aerial vehicles. Large exhibits include the originally top secret Lockheed Martin RQ-3A Dark Star and a General Atomics MQ-1L Predator. Suspended amongst the full size UAVs are a number of hand launched aircraft in service with armed forces around the world. Both world wars are represented by specific rooms in the museum and are filled with the most significant aircraft from each conflict. Particular highlights in the WWII room were an immaculately presented Mitsubishi A6M5 Zero and a nose section of a Martin B-26B Marauder. The example on show was named Flak Bait and served with the 449th Bombardment Squadron on operations over Europe. The aircraft acquired more than 1000 shrapnel holes, returned twice on one engine and completely lost hydraulics twice, but completed 202 missions; more than any other American bomber in Europe. Jet aviation and carrier operations are also both given dedicated sections. 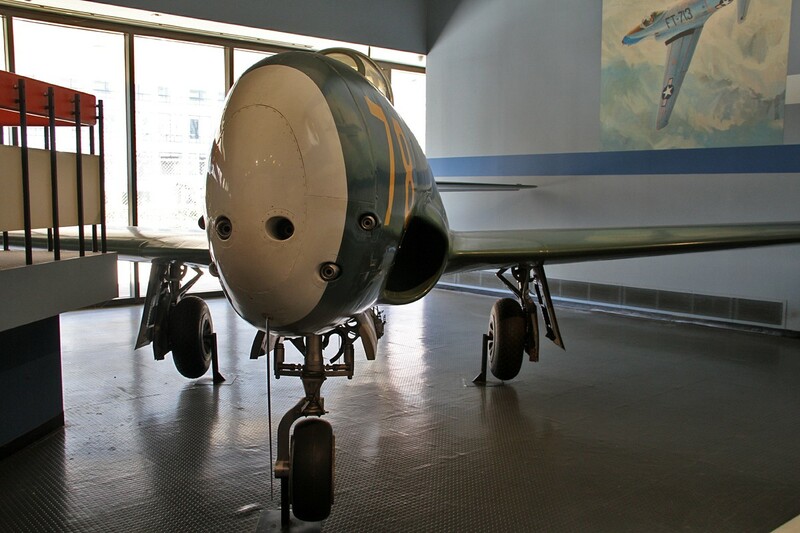 The former presents a number of early jet aircraft including a Messerschmitt Me 262A and the prototype Lockheed XP-80 Shooting Star, Lulu Belle. To tell the story of naval aviation, the Smithsonian has built a small aircraft carrier flight deck and island to show the aircraft in their operational context. From the ‘Bridge’ of the carrier a good view of the Grumman F4F, Douglas SBD-6 Dauntless and A-4C Skyhawk can be achieved showing the progress made in naval aviation over 30 years. A number of displays concentrate on the early pioneers of flight to the golden era of the 1930s. The contrast between the 1903 Wright Flyer and the 1935 Hughes H-1 is incredible, especially considering they are only separated by 32 years. 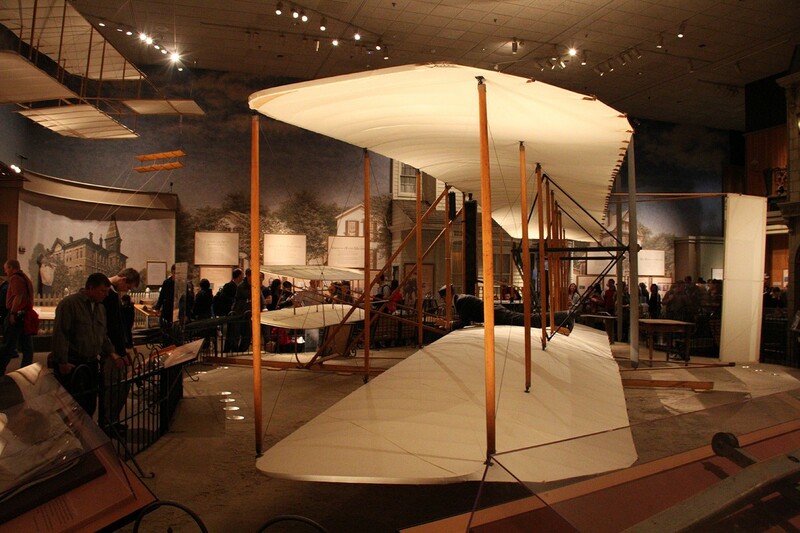 This illustrates one of the fantastic aspects of the Smithsonian: The collection is so comprehensive that the development of powered flight can be explored from 1903 to 2014 within 30 minutes. Finally, rooms are also dedicated to reconnaissance, navigation and spaceflight. The latter includes a number of areas containing almost everything that was used in the Apollo missions: A must visit for people with an interest in space travel and the iconic missions of the 1960s and 70s. Most impressive was the F1 rocket engine nozzle, arranged carefully with mirrors to give the impression of standing beneath the five examples that powered each Saturn V.
1935 Hughes H-1 Racer R258Y – Designed by radical entrepreneur Howard Hughes, the H-1 was developed to be the fastest landplane in the world. In 1937, Hughes piloted the aircraft from Los Angeles to New Jersey in a time of seven and a half hours, averaging a speed of 332mph. The aircraft features revolutionary low drag aerodynamics crucial to the development of radial engine WW2 types like the Republic P47. 1943 Lockheed XP-80 Lulu-Belle – American development of jet powered aircraft was behind the cutting edge work being carried out in the UK and Germany. The unveiling of the Messerschmitt 262 pushed the US into jet development resulting in the P-80 Shooting Star. The now infamous Lockheed ‘Skunk Works’ were christened during the development of the P-80 due to the secrecy surrounding the project. Lulu-Belle was used for initial flight testing and later for training bomber crews jet evasion tactics. 1947 Bell X-1 Glamorous Glennis – With the growth of jet powered aircraft, speed records were frequently broken. Until 1947 it was believed the ultimate limit for manned aircraft was the speed of sound. 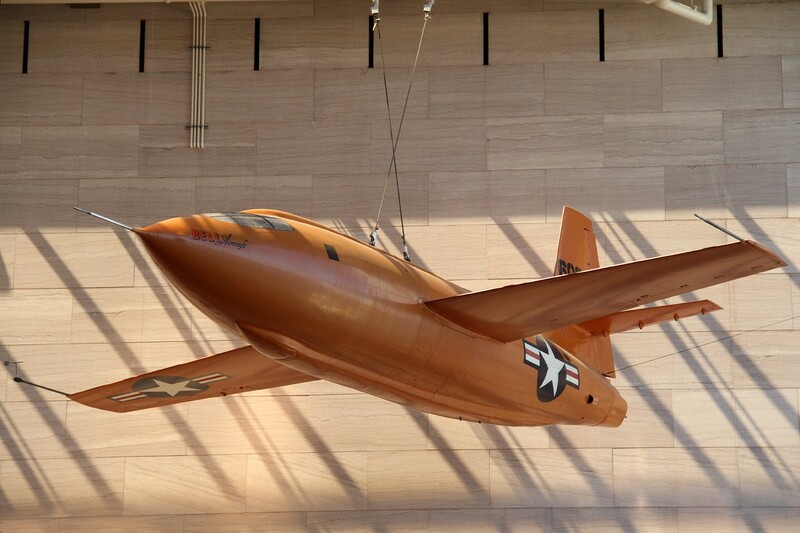 This Bell X-1 disproved this in 1947 when Chuck Yeager reached a speed of 700mph at an altitude of 43,000ft. Air launched from a B-29, the aircraft flew 78 times ultimately reaching a speed of 957mph in 1948. 1959 North American X-15 56-6670 – An important contribution to the US space program was the series of hypersonic research vehicle flights that culminated with the X-15. 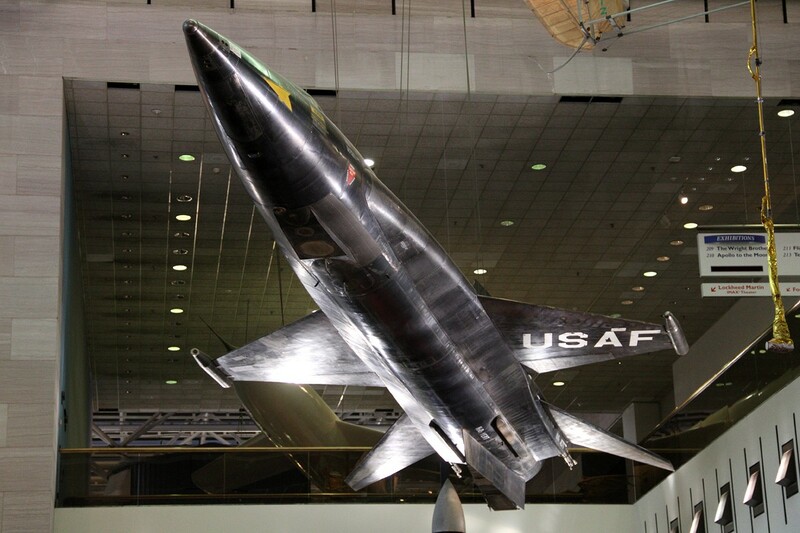 56-6670 was the first X-15 built of three and is the only surviving original aircraft (the second X-15 was upgraded to A-2 standard and is displayed at the Museum of the US Air Force in Ohio) The aircraft was air-launched from a B-52 and could reach speeds of up to Mach 6 at altitudes of over 67 miles. 1969 North American Rockwell Command Module no.107 Columbia – The 107th command module manufactured for the Apollo program took part in the most famous space mission of all time in July 1969. On July 20th, Michael Collins watched his fellow astronauts Neil Armstrong and Buzz Aldrin descend to the surface of the moon from Columbia and enter the history books as the first men to walk on the moon. 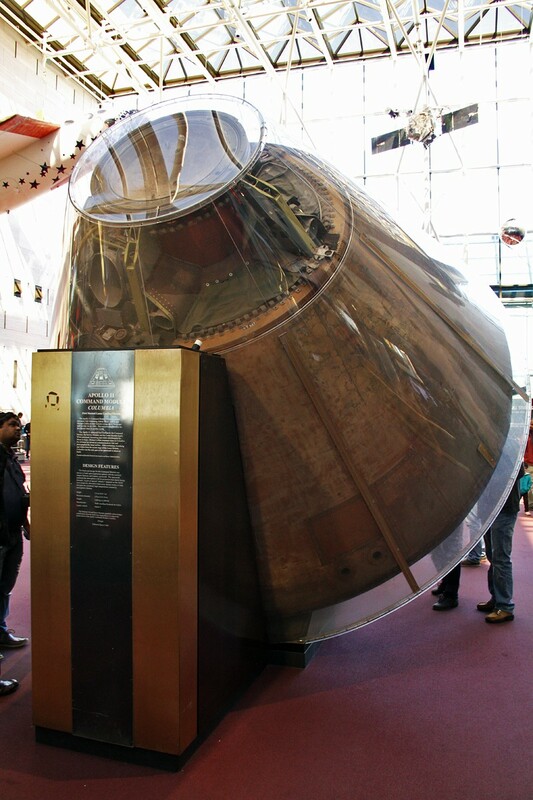 The command module was the only part of the Apollo 11 spacecraft to return to earth and was donated to the Smithsonian in 1970. Photography is a tale of two halves in the Washington DC branch of Air and Space. In the glass atriums the exhibits are well spaced and there is an abundance of natural light making for some excellent photographic opportunities. In the side rooms however, aircraft are often tightly packed in and there is very little light requiring a very wide angle lens and a steady hand, even at high ISO settings. This is not helped by the ban on the use of tripods within the museum. Many different angles are available of the exhibits in the main halls due to the second floor balcony that runs the length of the building. One of the main problems encountered during the author’s visit was the sheer number of visitors in the museum. 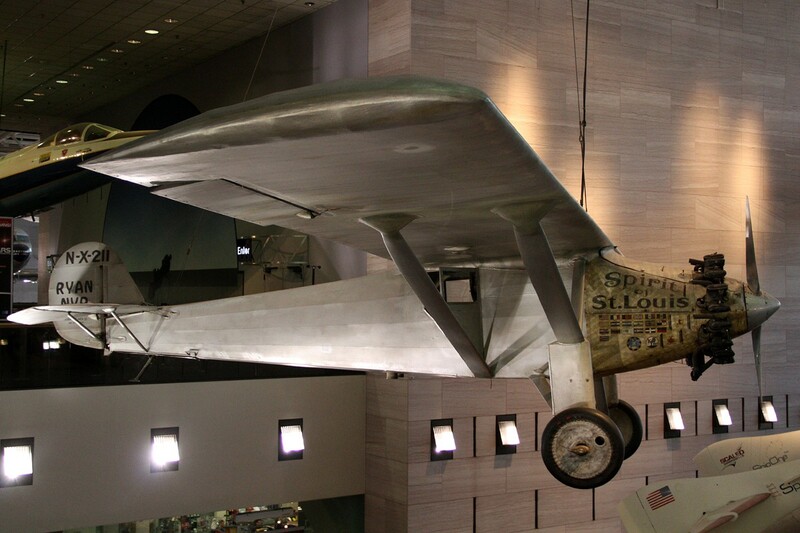 Air and Space is one of the most popular museums in Washington, especially at the weekend. It is very difficult to achieve clear photos without a lot of patience. On the Sunday of the visit the museum had extended its opening hours to 7:30pm. A return visit at 6:30pm resulted in much better opportunities with most of the side rooms being completely empty. The quietness also added to the superb atmosphere as more time could be spent exploring the unique and important collection rather than waiting for people to move out of frame. It must also be mentioned that more interior lights are turned on in the evenings resulting in some much better photographs of certain exhibits. Anyone interested in the history of aviation and space exploration must visit this museum. It has a higher proportion of internationally significant airframes than almost every other museum in the world that are well presented and thoughtfully grouped. The sheer number of exhibits means that multiple days are needed to fully explore the offerings of Air and Space; a luxury the author did not have. However, in the three hours spent in the museum it was possible to view every important aircraft if a route and priorities were planned carefully. Photography conditions were generally good, if a little challenging in some rooms, with the biggest problem being the number of visitors: One which the Smithsonian can do little about. Furthermore, the interactive displays and learning zones even taught this Aerospace Engineer a thing or two about how aircraft work. As a whole package Smithsonian Air and Space has no faults, especially for a museum that charges no admission fee. If you’re ever in the Washington DC area, it’s a no brainer. You won’t be disappointed. This is a great report. just want to correct one little thing though. There were only 35 Apollo command modules constructed, not the 107+ you state in your report.